Click here for the $7 coupon! http://tinyurl.com/258jtkh Pls RT! OC Foodie Fest this Saturday at Honda Center: are you going? If you call yourself a foodie, this is a "must attend" event! 50 Gourmet Trucks will be in 1 location at the Honda Center. Visit www.ocfoodiefest to get your tickets. HURRY! They're capping the admission to 8,000 people! If you've been watching the GREAT FOOD TRUCK RACE on the Food network, you'll recognize a few of the names! Friday Night Sessions at California Plaza is a free INDIE concert series held on the 2nd Friday of every month. Saturdays @ California Plazais a free concert series held every Saturday. Live acts include Hip-hop, R&B, Soul, Eclectic-beats and special event concerts. 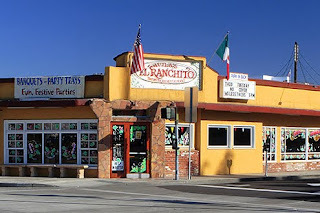 Tlaquepaque 99c Taco Tue, 99c Enchilada Wed, $2/$3 Burrito Thurs. and of course the $0.99 Taco Tuesdays!!! Click the link for the coupons Pick up Stix House Special Coupon Combo (with drink!) for $4.99! Don't forget 2-fer Tuesday and 25 cent WonTon Wednesdays! Click here for a printable coupon http://tinyurl.com/258jtkh Pls RT! It's just $5 dollars for all you can eat taco bar. There's also Drink Specials: $4 Dos Equis Lager or Amber, $4 Tuesday Margaritas & $5 Jack Daniels. As one Yelper puts it: It puts other Taco Tuesday's to shame! Taco Tuesday starts at 5pm and gets reaaally crowded after 6pm so GET THERE EARLY or else you will be stuck standing the whole time and that is not fun when you're trying to savor your food. After 6pm, the parking meters are free...but if you get there early enough they have a parking lot in the back. Taco Tuesdays is 21 and over, so sorry to the kids! Cash only at the AYCE taco bar, but plastic accepted at the restaurant. -Shredded Beef Tacos: The best thing here, relatively juicy with a mix of bell peppers and onions. 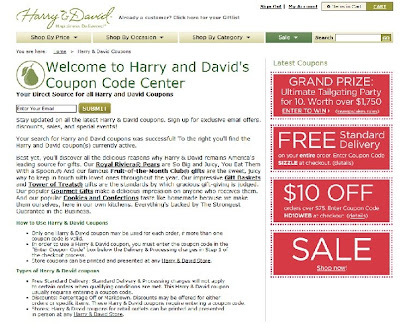 I stumbled across this by accident, and found out that Harry and David actually gives you the coupon codes on their web site. Click here and bookmark the page, or under "search" look up the word "free delivery". You can only use ONE discount code per order, so use the best one.